The MMDS downconverter is designed for reception of digital MMDS signals in the standard DVB-C format. The MMDS downconverter consists of a state-of-the-art receiver integrated with a dipole designed to be placed at the focal point of standard wire mesh antennas. 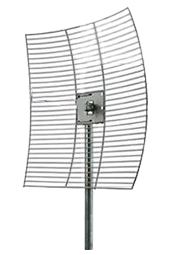 The MMDS high performance parabolic antennas provide unparalleled performance to MMDS subscribers receiving signals in the MMDS 2.5 to 2.7 GHz band. In addition to narrow beamwidth, the antenna has been engineered with low side lobes and also offers excellent front-to-back performance.